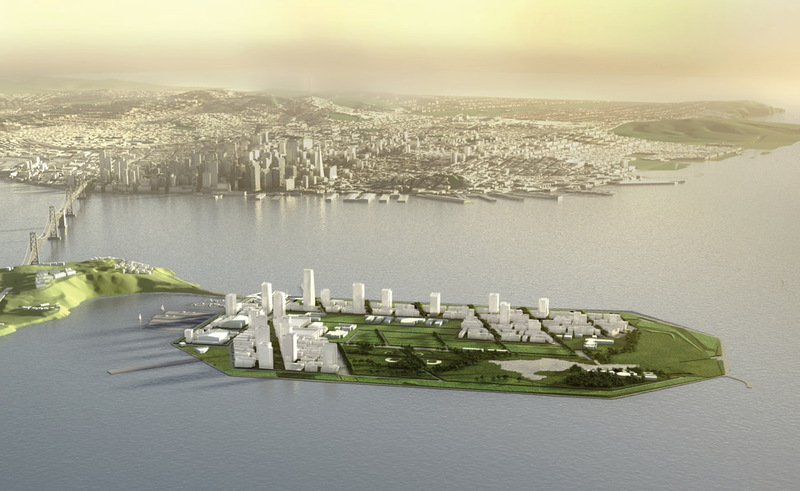 Narrowly passed by San Francisco’s Planning Commission in April, last night San Francisco’s Board of Supervisors unanimously approved the 550 acre redevelopment of Treasure and Yerba Buena Island and rejected the appeal backed by the Sierra Club and Aaron Peskin. Over the next few decades, 240,000 square feet of retail and commercial, 10,680 parking spaces, 8,000 new residences (2,000 of which will be affordable), and over 300 acres of open space will be developed on the islands, with ground slated to be broken next year. 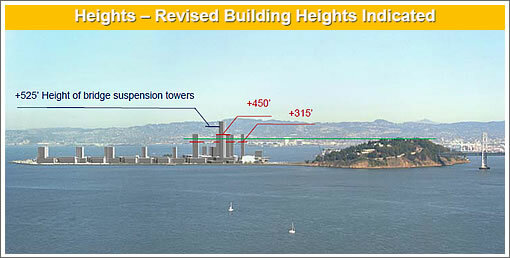 UPDATE: As a plugged-in reader notes (and links to a good overview that’s been modified a bit since), the maximum building height on Treasure Island will be 450 feet. Great! It will definitely be interesting to see how this one turns out. So — anyone consider sea level rise or tsunami on this one? How far above sea level is TI? Parks, baseball fields, soccer fields, bird sanctuaries — all much better ideas for low lying fill on the Bay. And, what about the fact that the only way to get there is the Bay Bridge? Correct me if I’m wrong, but isn’t there already extreme traffic on this bridge twice a day during commuter times? As a member of the San Francisco Golden Gate Rugby Club (and a member of the San Francisco Rugby Club since 1993 – we merged with the Golden Gate Rugby Club in 2000) my concerns are regarding our future on Treasure Island under this new plan. In 2004 we leased what was then the abandoned PX/comissary on the southeast corner of the island. Through a volunteer effort of club members we turned the old PX from an abandoned building into a clubhouse with a large banquet hall/club room, bar, home and away changing rooms, showers, referee’s meeting room, physio room and gym as well as some other VIP rooms. The field was dug out, graded and regulation goal posts installed. We also have aluminum stands for spectators. A women’s netball court was also installed for a local women’s netball club. Since then, and because of these facilities, the club has grown both in numbers and success. The SFGG Super League squad has captured the national title 2 out of the last three years, our Division II squad had made the playoffs, our high school squad has enjoyed success on the field and we’ve given these guys the opportunity to tour abroad. We also have a youth program for U-14 and U-10 players. Parents are very enthusiastic and supportive of us and the programs we’ve been running. The club has also hosted teams from around the country and around the world. We’ve hosted the USA Super League Championship, and again this August 6-7 we’ll be hosting the USA 7’s Men’s Club Championship. In short, we have risen to become one of the top clubs in the country, due to the extraordinary efforts of our members, staff, volunteers and the facilities that we have worked so hard to put into place. So what happens to us under this new plan? I don’t have the details of our lease, but I find it difficult to believe all the hard work we’ve put into this facility will simply be brushed aside in the name of redevelopment. We’ve literally changed the lives of all these young boys and girls who have discovered a sport that they can play for the rest of their lives.The clubhouse has become a focal point, reuniting old friends and players as well as providing a platform for future ruggers. I simply can’t imagine our club and some of the other groups on the island who have worked hard to see their programs develop and provide a positive impact on the community being brushed aside under this plan. I’m afraid you’re about to learn a hard lesson about making investments in situations where you have no ownership or property rights. Diemos – we’ll see about that. This is only the beginning. I built a sweet skateboard ramp on a vacant lot when I was 15, and before you knew it, dozens of kids were using it from all over the city. We even brought over a bunch of lawn chairs for spectators. Crazily enough, when the owner of the property wanted to build a house on it, we weren’t consulted. There was a late amendment to the plan which would provide something like 45 acres of athletic fields. There were people who ran athletic clubs on the island now who were lining up to sing the praises of the plan to provide fields. There are a lot of San Franciscans with zero vision that operate with a fear based attitude to any change whatsoever. This has led to increased gentrification and decreased housing supply. At one time we were the city that knows how – we’re very very slowly getting back to that now. In a tsunami situation, TI will be better suited than most of DT SF where there are daily multiple thousands of people – where is the concern there? I agree with aquaman on this one. It has already been noted that with probable global warming, the bay will rise to cover much of T.I. Granted that may be in 50 to 100 years but is this not what ‘planning’ is all about ? What would really make this work would be another BART tube with a station on Treasure Island. Since most of the island’s area is dedicated towards open space (parkland, gardens, sports fields) I think that Fishchum’s rugby club ought to be a shoe-in as an entity when the new parkland is developed. It fits well with the mission of any city’s parks organization. It would be hard to turn down an established and successful athletic club. Are you receiving a different message from the city Fishchum? Give everyone a break. It’s been noted? No, it hasn’t. It’s been hotly debated. Even more stupid than building in the path of sea level rise is allowing sea level rise to occur in the first place. We have other options. And it won’t be just Treasure Island that is affected. Indeed that would certainly help but be sure to budget for two tubes since you’d want to support bidirectional travel (BART tracks are one-way). Frequent ferry service to SF requires a lot less capital expense and I think that’s in the development plan. Why do we build two- four story projects along major transit lines in the city and 450′ towers on an island with only one means of ingress/ egress (and for cars, no less) for the tens of thousands of residents??? MOD – I’m simply a longtime club member and a veteran of Bay Area rugby. I spent many weekends working on the clubhouse, and I’m proud of the success we’ve had with such limited resources. I’m not privvy to the hierarchy that runs the club; I can only hope they’re doing their best to ensure the future success of the club. Wow anon.ed………so hostile so early in the morning ? Give yourself the break. I said “noted” not confirmed. “hostile” ? Give everybody a break + no + hotly debated = hostile? I’m aware of the study, the wide ranging possible scenarios it says could potentially occur, the degree to which climate scientists argue, and the internet thread on here about it. How many residents are they expecting when all is said and done? with 8000 units + commercial space, say 35,000? That’s certainly going to tax the hell out of the very short off/on ramps on the bridge right now. I can’t wait to see what it’s going to be like for a full 40′ semi+trailer to try to accelerate to get on the bridge. Combine that with the 5000+ (low ball estimate) for daily car traffic and it’s going to be a nightmare. How many cars do those exits handle today? Even at 1 per minute it’s only 1440 daily. The only way to make it succeed is some serious microcommunity planning to minimize the number of times residents will need to get on/off the island. And a very strong ferry program to obviate the need for those who only work on the island to bring a car with them. Who wants to have your heart skip a beat when getting on the bridge and then get stuck in traffic? I think not! Of course this project will make money but couldn’t there be a little more imagination? Cottages would be more fitting if there is going to be development. Perhaps they will start building condos attached to the bridge next? I hope the fake island will hold up those buildings well. I would be really nervous living there. Even the Marina must be 10X safer than Treasure Island when liquefaction occurs. Let’s say a prayer, a good thought or meditation for the people who will be at risk living there. I don’t think I’ll be around when any of this happens but it’s a really, really, really dumb idea to put so much development on a seismically risky, low, wind-swept island in the middle of the bay, with only one already near-gridlocked route off it (oh, yeah, plus a ferry–GMAB), when there are plenty of better places for new development in San Francisco itself (Third St. and Geary Blvd for starters). ^35,000? How does that math work? 8,000 units would be less than 20,000 residents, unless the theory is that household sizes are going to explode on TI compared to the rest of SF or the Bay Area. The amount of commercial space is practically meaningless, as it’s all neighborhood-serving. How fast to ferries travel? And what about windy days when ferry service is shut down? I’m not sure if that makes economic sense. Any future Transbay Tube would likely come in lower and include rail besides BART that wouldn’t stop at Treasure Island. They definitely need to charge a fee for TI car commuters to account for the increased usage of the bridge, although someone said on another thread that this was already planned. In fact, the whole plan doesn’t make economic sense. It’s a huge investment with very little return. I think the plan would be fine if they were aiming for a reasonable number of units. 8,000 is just ridiculously low, should be more in the range of 40-50,000. I mean, geez, we’re building something from scratch, so make it self-supporting. Like the idea of Bart extension. MUNI? Didn’t Roosevelt Island extend a subway to get residents to Manhattan (and um, Queens)? The bridge connection on its own will be a major issue. Water taxi, ferries have to happen here — all around the bay. There are v sizable waterfront developments in the works to help drive the critical mass. I took ferry daily to Alameda 4 years — quick, clean, fast, pleasant, coffee and the paper. I had a car but dreaded traversing the Bay Bridge — even as a ‘reverse commute’. 2nd Peskin fail in as many days. Just sayin’. Do any of you actually read master plans or the EIRs they spawn? – The island will be ‘compacted’, raised and have a berm around it. – Ferry service will run every 40 minutes unless demand justifies more service. – Bridge on/off ramps will be reworked on the east side of Yerba Buena Island to handle increased traffic. – Island access will cost you – currently projected as a $5 toll. If you seriously think that nobody studied the soils or rising sea levels, you’re deranged. They’ve studied this for 15 years, including at least 3-4 of environmental studies specifically. This has all been analyzed plenty. Isn’t there a plan in the works to add an extended bike path on the Bay Bridge? Can it be that San Francisco now has a government that can think clearly? Two intelligent decisions in favor of real progress, not the backwardness that the people who have hijacked the word “progressive” would promote. 1. Transit first, by which they mean less parking for cars and encouraging people to ride around the block looking for a space. 2. Keeping in-laws illegal. People who live in multi-generation families should have the right to create room for their relatives. What is wrong with more units? 3. Dwelling Unit mergers. This should be allowed just as it is in Paris, London, New York. It is mad to refuse mergers to people who spend $1.2m for the one bedroom condo next to their current apartment, claiming it reduces “affordable housing.” There is nothing wrong with family-size dwellings. 4. 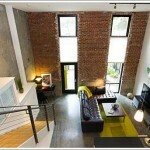 Condo conversion should be expanded. 5. Permit approval needs expediting, and harassment by Discretionary Review minimized. 6. Rent control should be eliminated for small owners of buildings with 2-4 units, as it used to be. I am sure you all can think of others. The new east span includes a bike/ped path. There are proposals to retrofit the west span with a path but no funding source has been secured yet. 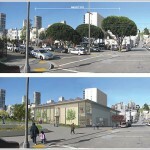 @North Beach Tony – what was the other Peskin fail? And speaking of which, doesn’t the President of the Board of Supes select the Supervisors’ nominees to the Planning Commission? If so, David Chiu’s recent votes would suggest far more rationale nominees to the Planning Commission in the future. I could see going the little or no development route. I could see (and would probably favor) going the heavy development route. But this in between stuff is maddening. They’re going to create something that doesn’t have the critical mass to sustain itself. SF gets another bedroom community and a sleepy one at that. I have to LOL at the renderings, though. Glad to see there’s plenty of other folks along with Aaron Peskin who think this project is insane. What are the financial ramifications, amount of funding that the redevelopment agency is ponying up for this? What’s so clear is the analogy to the sub prime fiasco. with bankers lent money to unqualified borrowers. In this case, supes, their developer friends, and commercial banks will be long gone when the mortgage holders are hit with all these defaults when valuations plummet, when the science is better known 10 years from now. By then we may know better how long it’ll take for the west antarctic ice sheet to break up, Everything is happening so much faster than predicted. Here’s the real calculus. Heck the planet is coming apart far faster than ever imagined. Let’s blow the money while we can. Do not forget Moore’s poodle, Olague. When are their terms up? @PN: If you believe the self-serving nonsense in the EIR for this project, you are dumber than I would have guessed. I assume YOU are planning to move out there and be dependent on a ferry (how’d you like a $5 toll to leave your neighborhood?) while taking your chances the “compaction” works (like those tsunami walls in Japan). Reworking the bridge ramps will not help the gridlock ON the bridge, by the way. Ask anybody who commutes on it. Question: Who sold this city on tearing down the entire Victorian housing stock of the Western Addition, and replacing it with cheaply built, non-descript housing? Look how that worked out. Short term plans by small-minded people who have no real vision. When things are done by committee the first thing that happens is you throw out the best and worst ideas and settle for mediocrity. My point in asking this, is I’m POSITIVE that any pre-development reports on our precious Presidio development probably anticipated over the top demand and exorbitant rents for these spaces. However, last I heard they were mostly vacant. Don’t mean to get too far off topic, but the point of all this is, OF COURSE the self-serving reports make it sound good. I know I’d sleep well living behind that man-made berm when the next earthquake hits. Folks — we live in one of the most active seismic zones on earth. Are you all going to tell me that there won’t be even a small tsunami here in the next 100 years? How high is this berm going to be? And, the whole thing is built on fill? Yeah, sign me up — I’ll take two adjacent units and apply for a dwelling unit merger! Oh yeah, and I won’t ever drive anywhere between 7 and 10 am, and between 3:30 and 7 pm. Sorry, but this plan is going to define stupid to a future generation of planners. For those of you familiar with the Trader Joe’s on Masonic Ave. in SF, do you think they had to do a traffic impact study as part of opening that store in that location? Question, are these the same people who are doing the traffic study for the proposed TI development? And, are the same city bureaucrats reviewing (and approving) the TI traffic plan? For anyone who has waited in line for TJ’s parking, all I have to say for the future TI residents is, good luck with that line to get on the bridge. The effect on traffic aside, it will be interesting to see what the premium will be to live out there. I had a friend that made it for about 3 months – too windy, damp, and cold. Personally, I wish they built a couple of casinos with ferry service, the counties could make some money and it would be cool. This is perhaps the worst idea ever. @aquaman: hope you’re never in the FiDi or Marina District or Foster City or Sausalito or Marin City or half of the south Bay, as those places will be absolutely mauled by any tsunami that comes in. On top of all this $650 million on the financing comes from tax increment financing which will add another 65 basis points to you taxes on all new apartments in the plan. So that results in a 1.85% tax rate on property on top of any condo fees each month. Even on a 800k apartment this results in $1800 a month in taxes and condo fees before you pay the mortgage. On top of this this 25% of your neighbors will include the formerly homeless, section 8, BMR, etc. And don’t forget about JobCorps which will still have a large portion of the island dedicated to reforming our local youth. I would be curious what people think is the market rate for 1, 2 and 3 bedroom flats based on these factors? If I remember correctly, the new eastern span of the bay bridge has a bike lane, so I guess you could commute from treasure island via bike to Oakland/Berkeley. @anon– you are absolutely correct about all the low-lying areas your mentioned — but those are ALREADY developed. And, in case you’re wondering, I intentionally do not own property in any of those areas. I was here in 1989 and I walked through the Marina the day after the Loma Prieta quake. I saw first hand what happens to buildings built on fill. It would be fascinating to know if this proposal was put before our Board of Stupidvisors in December 1989 if it would have any chance of approval. I believe one definition of insanity is people keep repeating the same behavior and expect different results. That is how I view this development. So, all that being said, at TI we have the unique opportunity to LEARN from our past, short-sighted mistakes. However, human nature seems to prevent us from doing so. The place should either be a wildlife sanctuary, athletic fields, and maybe a casino or some combination of the above uses. I would bet my last dollar right now that the housing out there is a colossal failure as compared to the projections. I can’t really think of good reasons why someone would choose to be there over other choices in the Bay Area, unless it is really cheap — and if it is really cheap it will not be a financial success. I spent many weekend days there with my son at Little League games, and as others have mentioned, it tends to be cold, foggy, damp and windy. Add to that the Bay Bridge issues (and this was only on weekends), and I wouldn’t move there if it was almost free. Just to elaborate you saw what happens to buildings built on fill that were constructed to century old standards. @MOD – You’re not wrong, but it isn’t that simple. Some were old, some were obviously newer. However, here is how I think about it. Take a glass and fill it with sand. Then shake the glass. The sand all moves, and anything built on the sand moves. That is essentially how liquefaction works. Much of San Francisco has buildings that were constructed to century old standards. The vast majority of those buildings sustained little or no damage. I don’t care what kind of engineering you do for TI, if the ENTIRE area you are building on is soft, and liquifies, you are going to lose. I think humans need to be less arrogant in the face of nature. History has shown us that every time humans think they have nature beaten, they are generally proven wrong — it may take time, but nature always wins. So, when TI is devastated by an earthquake and follow-up tsunami in 50 years, no doubt the owners at that time will cry foul and look to taxpayer money for a bailout. I say if they want to build it, they should have to self-insure for future damage. By the way, in the 1989 quake I happened to be on the hill above Dolores Park (close to Sanchez and Cumberland). I was in an 1880 Victorian with a brick foundation. There was NO damage. It barely moved. The hill is made of rock. That experience has guided my real estate choices ever since. The whole project seems very similar to Roosevelt Island development located in the east river between Manhattan and Queens. The site has both subway and tram access, and despite many years of effort, remains cold, disconnected from the city, and complete off the cultural map of NYC. No restaurants, bars, etc that draw anyone to the island, and minimal infrastructure on the island itself for its residents. It feels sad and deserted. This in a development that is about 1/3 of a mile away from the Upper East Side and with higher density than what is proposed at Treasury Island. SF is crazy to expect a different result with an island located further away from the city, without BART access, and lower density. you are absolutely correct about all the low-lying areas your mentioned — but those are ALREADY developed. And, in case you’re wondering, I intentionally do not own property in any of those areas. I was here in 1989 and I walked through the Marina the day after the Loma Prieta quake. I saw first hand what happens to buildings built on fill. @aquaman – so you were spending your time looking at 80 year old buildings and what happens to them on fill during an earthquake. Did you also happen to stroll downtown and look at the buildings from the last 30 years that are literally 50 times as tall? What happened to those? Are you assuming that TI is going to be using the building standards from the Marina circa 1925? Why would they do that? but we’re twee little san francisco and we like to keep our non fact based knee jerk opinions about the viability of ANYTHING new or innovative. aquaman – You have a good point about constructing stuff that could become an economic liability after the Big One. That same point goes for everything constructed in the bay area, not just TI. I think that seismic codes should be “reinforced” to improve the building’s chances of habitability post-quake. Current codes are mainly geared towards ensuring that the building can be safely evacuated. A safe escape is definitely a higher priority than post quake habitability but ensuring that the building can be reoccupied with minimal expense is also very important. In Tokyo there are multistory buildings built on top of giant shock absorbers to limit the energy transmitted to the building’s frame. Maybe we need to start doing that here too. The problem isn’t that the homes will be built on fill, or that TI might be flooded. Those are potentially known risks that can be adequately calculated for by the professionals on staff of various insurance agencies. The potential for such damages can then be appropriately priced into the policies. The problem is the common assumption that “I don’t need no stinkin’ EQ/flood insurance. It’s too expensive, and my brick foundation house rode out the ’89 quake just fine. After all, if things are bad enough the gov’t will come to my rescue anyway.” It happens again, and again, and again. All those homeowners in Missouri living ON THE BANK of the river without flood insurance. And what % of SF homeowners have EQ insurance? Or even just the % of SF homeowners with un-retrofitted properties built on loose soil? I would argue that the better solution is to simply make any homeowner ineligible for gov’t recovery funds if they didn’t first take adequate measures to cover their own a**. Please review your geology if you’re worried about a massive tsunami in SF. Tsunami are caused by huge landslides or vertical thrust faults. The San Andreas and associated faults nearby are all lateral strike-slip faults. No risk of any tsunami above a few feet, and that would have to travel several hours across the Pacific first. It doesn’t have to be across the Pacific, does it? My impression is that earthquakes in Alaska and the Pacific Northwest can cause tsunamis. To what extent does being in the Bay reduce the magnitude/severity of tsunamis? Thank you for the brief scientific interlude. There are plenty of reasons for not building on TI, but a Japan scale tsunami is not one of them. It’ll be sad and windswept. The only life will be the play fields. I’m sure this has been figured into the prediction calculations but the bay is well protected by the Golden Gate. Any wall of water would need to squeeze through that strait to get into the bay. It throttles and moderates the effects of a tsunami. On the other hand the Ocean Beach edge of the city is unprotected. How many 2,000 foot buildings are there in SF? Anywhere? @Joe: remember Kyoto 1995. Over 6,000 people killed. Japan is not the best exemplar of earthquake preparedness. Chile did better. All the same, this would be a terrible place to live, regardless the size of the buildings. The average height in the Marina is nowhere near 40′, let alone that being the minimum height. You’re just quoting the maximum height limit in the Marina, and I’m not quite sure what you’re trying to say anyway. Suppose the buildings are only 20 or 30 times higher, does that somehow disprove my point? I object to the hyperbole. It’s just hard to have reasonable discourse with such statements flying around. I don’t really see much hyperbole, I s’pose. There are plenty of 15′ structures in the Marina, and there are several 750′ structures in the FiDi. @aquaman is right about the Marina in 1989, I was living in the city also. Some can claim it was the poor construction of structures in the Marina, but that was only half of the damage. The reason residents could not move back into those structures that had little damage in the Marina for many MANY months was because of broken gas lines, ruined power grids, sewers dumping water up into the street, and broken fresh water pipes. The entire infrastructure, as well as many roads and sidewalks, had to be completely rebuilt. All you had to do back then was cross Lombard or Chestnut and head south and then VOILA, no damage, with people shopping , eating and living in their homes without any interruption in their lives from the event. 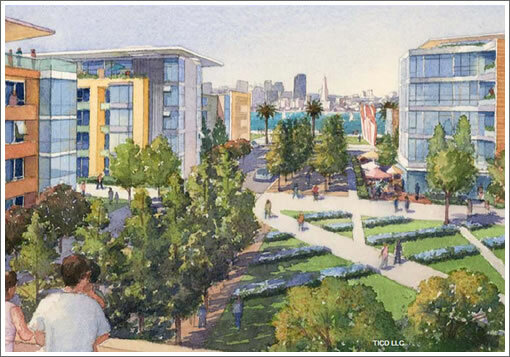 The development of Treasure Island into housing will be remembered as one of the greatest planning mistakes ever made. Weren’t the gas lines, sewer system, and other Marina infrastructure systems also built to nearly century old standards? I don’t expect modern utilities to escape damage from the Big One though they ought to be more robust. It’s almost comical at this point to read the continuous disaster fantasies spewed on this site. I imagine if the same people were around in the mid 30’s, they’d be shaking their fist at the planned golden gate bridge. No kidding, joe. The “global warming is 100 percent going to cause worldwide flooding” folks are funny. Climate scientists disagree, and even the ones who think the poles are melting more these past two decades are pretty measured with their wording. The earthquake-calamity folks are silly to act as if new buildings on treasure island won’t be engineered to withstand earthquakes. (But yes, lots of stuff in the Marina and elsewhere is still not going to fare well.) The tsunami ones have never looked at what a tsunami might do to the Bay. Because the Sunset is the at risk area, there. My objection is not about the disaster issue (although that would keep me from living there, among several other reasons), but also the fact that it doesn’t make financial sense, among other things (look at the cost vs. return, as I mentioned above). They also haven’t adequately thought about ingress and egress, most likely. We’ll probably hear about some “perfect storm” of factors that led the projections to be wrong, even though that usually means you were multiplicably stupid instead of singularly stupid. Wow, that’s a lot of faith considering how NIMBYism rules around here. The “city that knows how to obstruct progress”, maybe. It’s not like its free to propose development in SF – I’m pretty sure the developer has a better sense of financial viability than the average person on socketsite. My point was a housing choice CAN take safety into account. While Pacific Heights and Cow Hollow, and the rest of the city for that matter, had gas service, electricity, power and water restored within hours of the 89 quake, the reconstruction of liquifaction damage to services in the Marina took many months. I think it was over 6 months to get the power back up on some streets. Why not live on a hill of bedrock instead of some landfill? The Marina, like Treasure Island, is a landfill! But I wanted to ask, does anyone know how all of the construction materials will be brought to Treasure Island? Barges I would hope, but you can bet thousands of truck loads will clog up the bridge during this massive building project as well as cars and trucks used by contractors going to and from the island. It’s nice when someone makes my argument for me. Keep in mind though that the developer is only exposed to liability and risk for a limited time. Once the developer washes their hands with the project any future problems become a concern of city hall. And SF is basically taking responsibility for the 25% subsidized units from the get go. BobN makes a good point that this might be not enough development for critical mass. I can understand not developing this all at once but I hope it can accommodate a second phase of building if that makes sense.